WMO reports that the surface area of the 2015 Antarctic ozone hole is among the largest observed, according to a new Bulletin from the World Meteorological Organization (WMO). This is because of colder than usual high-altitude (stratospheric) meteorological conditions. WMO stressed that the temperature conditions in the Antarctic stratosphere vary from year to year, so that in some years the ozone hole is relatively small and in other years relatively large. Overall, however, this does not reverse the projected long-term recovery in the coming decades. The surface area of the 2015 Antarctic ozone hole is among the largest observed, according to a new Bulletin from the World Meteorological Organization (WMO). This is because of colder than usual high-altitude (stratospheric) meteorological conditions. 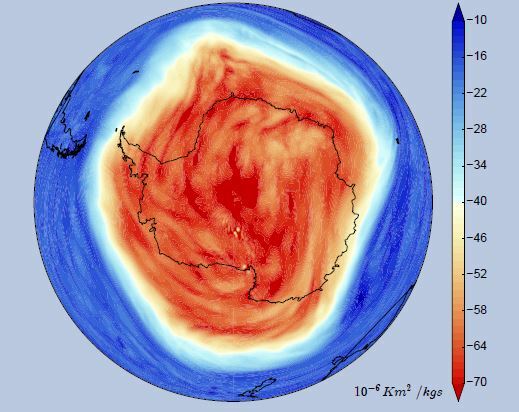 WMO stressed that the temperature conditions in the Antarctic stratosphere vary from year to year, so that in some years the ozone hole is relatively small and in other years relatively large. Overall, however, this does not reverse the projected long-term recovery in the coming decades. On 2 October the ozone hole reached its maximum extent this year with an area of 28.2 million km2. This is the largest ozone hole area ever measured on this specific date according to the data record from NASA. Since 2 October the ozone hole area calculated by NASA has been larger than any other ozone holes for those dates. Averaged over the 30 consecutive days with largest area, the number is 26.9 million km2. This is the third largest observed after the record-breaking ozone holes of 2000 and 2006. “This shows us that the ozone hole problem is still with us and we need to remain vigilant. But there is no reason for undue alarm,” said Geir Braathen, a senior scientist in WMO’s Atmospheric and Environment Research Division. The stratospheric ozone layer, which is found at about 25 kilometers altitude, protects us from the harmful rays of the sun. Ozone depletion – which occurs annually during the southern hemisphere spring – is caused by extreme cold temperatures in the stratosphere and the presence of ozone-eating gases in the atmosphere such as chlorine and bromine. “The 1987 Montreal Protocol on Substances that Deplete the Ozone Layer phased out the most harmful chemicals, like CFCs or chloroflourocarbons, which used to be found in refrigeration and insulation equipment. As a result of the broad compliance with the Protocol and industry’s development of “ozone-friendly” substitutes for the now-controlled chemicals, the total global accumulation of Ozone Depleting Substances (ODSs) has slowed and begun to decrease. Substantial recovery of the ozone layer is expected by the middle of the 21st century, although over the Antarctic it will be later – probably around 2070. “The Montreal Protocol is in place and is working well. But we may continue to see large Antarctic ozone holes until about 2025 because of weather conditions in the stratosphere and because ozone depleting chemicals linger in the atmosphere for several decades after they have been phased out,” said Mr Braathen. WMO publishes its Antarctic Ozone Bulletin at roughly two to three weeks’ intervals from August to November. The bulletins are based on data provided by members of WMO’s Global Atmosphere Watch network which operate ozone monitoring stations in the southern hemisphere. During the southern hemisphere winter, the atmosphere above the Antarctic continent is cut off from exchanges with mid-latitude air by winds known as the polar vortex – the area in which the main chemical ozone destruction occurs. The polar vortex is characterized by very low temperatures leading to the presence of so-called polar stratospheric clouds (PSCs). As the polar spring arrives in September or October, the combination of returning sunlight and the presence of polar stratospheric clouds leads to a release of highly ozone-reactive chlorine radicals that destroy ozone. Ozone depletion this year started relatively late because the polar vortex remained in the polar night during July and most of August. When the sun came back to the polar region in late August, ozone depletion picked up rapidly. The stability of the vortex led to low temperatures in the stratosphere and an above average area of nitric acid polar stratospheric clouds during August and September. The maximum ozone hole area that has been reached in 2015 is quite similar to that of 2008. The difference is that in 2015 the vortex has remained cold and stable and there has been very limited transport of ozone rich air from middle latitudes. In some of the recent Antarctic ozone hole seasons there has been substantial transport of ozone above the ozone hole altitude range (12-21 km or so). This has in recent years often led to the total ozone column being above 220 Dobson Units (the threshold for declaring ozone hole conditions) despite the fact that the 12-21 km region has been substantially depleted. In 2015 we have not yet seen such in-flux of ozone rich air above the ozone depleted height range. The stability of the vortex causes the low ozone to persist, and that at a time of the year when total ozone normally goes up and the area of the ozone hole goes down in size. The Ozone Bulletin contains data from the following Global Atmosphere Watch stations: Arrival Heights, Belgrano, Davis, Dôme Concordia, Dumont d’Urville, Halley, Kerguelen, Macquarie Island, Marambio, Mirny, Neumayer, Novolazarevskaya, Río Gallegos, Rothera, San Martin, South Pole, Syowa, Ushuaia, Vernadsky, Vostok and Zhongshan. WMO and the scientific community will use ozone observations from the ground, from balloons and from satellites together with meteorological data to keep a close eye on the development during the remainder of the season.